Cakwe, one of my favorite street food from Medan, Indonesia. Actually, Medan host a lot of delicious snacks, but this one is my absolute favorite, I will be tempted to buy one every time I see them sold. 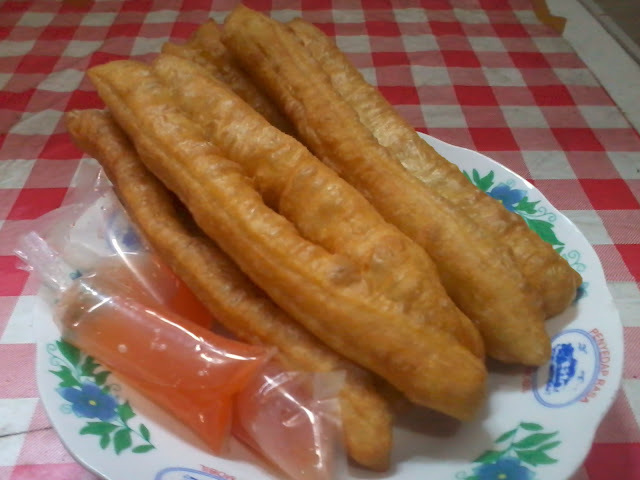 Cakwe is some kind of fried cake, like donuts, but it is very different from donuts. For one thing, donuts in Indonesia is associated with sweet taste, and Cakwe is usually accompanied with hot/sour sauce. Chewy and fluffy on the inside and crispy on the outside but have a very light structure. It was most delicious eaten when freshly deep-fried, and then dipped into the sauce – some kind of unconsecrated hot-and-sweet chilly water – or the sauce poured into it, like what I prefer. This is eaten by hand, no need to bother to try eating it with cutlery, it is very hard to cut and won’t be as yummy. Usually, Cakwe is sold with “Kue Bantal”, literally translated “Cushion Cake”. Sometimes Cakwe also become a topping of dishes, cut into small pieces by scissors. One of the most usual dishes topped with Cakwe is rice porridge. Why did fried food taste soo good?